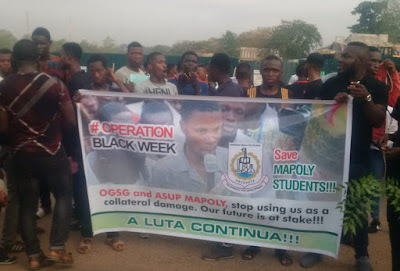 The Ogun State Police Command on Tuesday arrested 20 students of the Moshood Abiola Polytechnic, MAPOLY, for allegedly vandalising government and personal property in Abeokuta metropolis. The students were part of the protesters who thronged the streets on Tuesday to protest the failure of the polytechnic management to fix dates for them to write their semester examination. The examination had been stalled for over three months, following the unresolved face-off between the government and lecturers over the establishment of the controversial Ogun State Polytechnic, Ipokia. However, the 20, while carrying out the protest tagged ‘Black Week’, were alleged to have vandalised a number of property in Panseke, Oluwo and Iyana Oloke areas of Abeokuta. They were equally‎ alleged to have set bonfires close to the pedestrian bridge currently under construction in Panseke area of the state capital while a section of the bridge was set ablaze. The students also reportedly made an attempt to barricade the route to the governor’s office at Oke-Mosan but were prevented by the police from advancing beyond Panseke. A witness said police officers had earlier assembled at the Panseke junction to prevent the students from gathering. The account noted that the students were undetered and later blocked all routes to the school from Panseke and took the protest to the entrance of the school. At the school, the protesting students requested the acting rector, Ayodeji Tella, to lead them to the governor, whom they insisted must address their complaints. The rector subsequently rode in an Hilux van driven by the chief security officer of the school, Adekunle Adekoya, while the students hung to the back of the van. However, there was a twist when the students were told that the vehicle couldn’t move again because of a mechanical failure. The students offered to continue their advancing by pushing the vehicle to the governor’s office but the driver reportedly suddenly zoomed off injuring about four students in the process. The state police public relations officer, Abimbola Oyeyemi, said the arrests were necessary following the alleged destruction of public and private property. Mr. Oyeyemi told journalists that the officers had to use ‘minimum force’ to disperse the students. He said the students, who also reportedly injured a police officer on Monday, would be charged to court on Wednesday. Meanwhile, the Ogun State Governor, Ibikunle Amosun hinted that the students would pay for any destruction made to public property. “They are instigating the students. We know how to handle ourselves. If any student destroys anything, they will pay for it, they will pay. We were also made to pay then,” he said apparently referring to his time as a student. “I have been getting reports, they will pay, they have to pay for it (destruction) because this is Ogun State money,”‎ an irate governor was quoted as saying.